The Dental Tribune recently ran an article about Dr. Magnuson’s dedication to dentistry and the Kalamazoo and Grand Rapids communities. The article highlights how Dr. Magnuson has been making people smile for 30 years. To read the entire article just click on the image below. 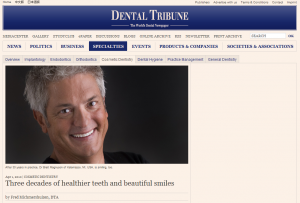 The Dental Tribune, also known as “The World’s Dental Newspaper”, is a top publication in the dental community reaching millions of dentists and dental professionals world wide. The publication reports the latest news about everything in the world of dentistry.